We are proud to present apartment Anemone, one of our professionally designed one bedroom apartments. Please note Anemone is not advertised as a sea view property; it enjoys garden views. Covering almost 50m2, the open plan kitchen / living area features a fridge freezer, twin cooking stove, microwave, coffee machine and kettle; alongside all the necessary crockery, cutlery and utensils to make your stay here as comfortable as possible. The double bedroom features a double bed and built in wardrobes for ample storage space. The living area includes a sofa bed (which turns into 2 singles if required), coffee table and dining table and chairs for 4. Both the bedroom and living room have patio doors that lead to the large private balcony. Eucalyptus Apartments are part of a new communal apartment development located in the traditional village of Karavomylos, approximately 2km from the port town of Sami, and located in the same village as the famous Melissani Cave. 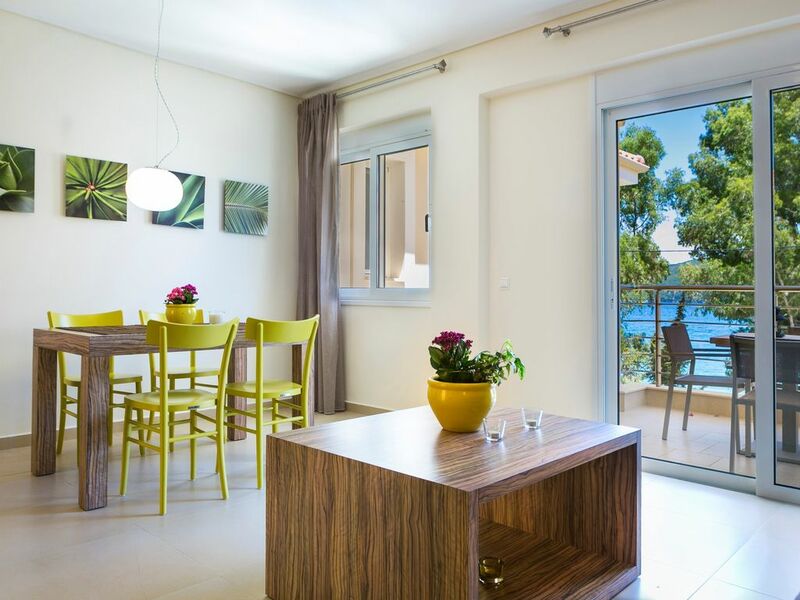 At only 10 meters from the Ionian sea, these self-catered apartments are perfect for those seeking a quiet, relaxing holiday. We have enjoyed consistent compliments and high rated reviews from our clients, and are fast becoming the de-facto standard for quality accommodation in the area. Each and every apartment has been professional designed, decorated and furnished to a very high standard. The selection of photographs provided are all true to form for each property. Air conditioning, TV and Wifi are included as standard. We also provide full apartment cleaning twice per week, including fresh towel and bed linen replacement. The development also includes a communal swimming pool, with sea views and underwater lighting. Free car parking is available around the whole development. Within walking distance, there are several traditional taverns (the closest only 30 meters away), a mini-market, a bakery and a church. The nearest town is Sami, a few minutes drive, or a 20 minute walk along the beach. A traditional port town, with many tavernas and bars, as well as supermarkets, butcheries, green grocers, bakeries, pharmacy, ATM, medical centre; and all the other essentials for a comfortable stay. Also within a very short distance from the development are tennis courts, basket ball court and an astro-turf 5 a'side football pitch. A small pebble beach is available only 10 meters from the complex, a larger organised beach (Karavomylos Beach) is only a 15 minute walk. Also available across the island are various activities, including but not limited to Horse Riding, Snorkeling, Kayaking, Swimming, Wine Tasting, Water Sports, Boat Rental and Fishing. Due to this central location on the Island, few of the many places to visit are more than an hour's drive away. This includes Fiskardo to the north (1 hour), the famous Myrtos beach (30 mins drive) Skala (45 mins drive) the capital Argostoli (40 mins drive) and the airport (50 mins drive). Much closer are Antisamos Beach (10 minute drive), Melissani Caves (2 mins drive or 10 minute walk) Agia-Paraskevi beach (5 mins drive) and the port town of Agia Efimia (10 mins drive). Due the size of the island, a rental car or scooter is highly recommended. Upon arrival, the onsite manager will introduce you to the apartment, and provide welcome refreshments. Towels, extra linens and periodic cleaning are included in the rental cost. A tour of the complex will include details of places to visit, directions and any other help required. Please note the standard check-in time of 14:00, and check-out time of 11:00. A 100 Euro damage deposit will be required at the time of arrival, and will be refunded at your departure, subject to an apartment inspection. For Apartments Amaryllis, Hibiscus, Meli & Hyacinth - Please Enter 1436327 Into The Search Box And Hit Enter! For Apartments Canella, Leyland, Neroli & Levanda - Please Enter 6109311 Into The Search Box And Hit Enter! For Apartments Yasemi & Lotos - Please Enter 6109306 Into The Search Box And Hit Enter! Newly developed complex including modern furnishings and equipment, 10 meters from the sea. Located in a traditional and beautiful village 500m from Melissani cave, away from the hustle and bustle of the main town, but close enough to walk to along the coast. Onsite Managers throughout the summer season to assist our clients. Highly knowledgeable of local, surrounding areas and island in general. Sofabed, TV, Dining Area, Coffee Table, Side Unit. Lovely apartment with everything you need for a short stay. Very good position, with pool and the sea right next to apartment. Pleasant walk to Sami for cafes and restaurants. Delicious honey and biscuits very welcome. Good advice from Harry about where to go. Fantastic apartment set in a nice area , opposite the sea. Karavomylos is beautiful , very quite , Sami is a 30 minute walk away along the beach front with stunning scenery. All in all had a fantastic month there . The apartment was everything we could have wished for with everything you would need. Our only grievance was on our third week our ( lovely manager ) Harry ( who was fantastic ) had to come and inform us that we had made to much noise the previous evening , bear in mind we are aged 55 plus and it was 4 people sitting on the balcony talking . This will be the only reason we would not stay here again. Lovely welcome to apartment and excellent service throughout our stay. Nice clean apartment on arrival and it was cleaned and sheets changed frequently throughout our stay. Thoughtful array of drinks and some homemade biscuits were very welcome after a long journey as meant we didn’t immediately have to rush to supermarket. Apartment well set up with everything we needed. Even included enough shampoo, conditioner, body wash and moisturiser for whole family for a two week stay. Lovely area - not too busy even though it was August. Could walk to the town for a meal or to a pebbly beach for a swim. Good base to explore the island - we hired a car. The swimming pool was perfect and never too busy. Would highly recommend. Just returned from a two week stay in Eucalyptus Apartment called Anemome. The apartment was well equipped and had everything we needed. The balcony was relaxing with a small sea view, which was in the shade most of the day. The beach and pool are so close and with easy access. as well as the usual things you expect from your stay,the owners/staff really went the extra mile here! welcome pack and wine as standard.toiletries in bathroom,fresh coffee for the machine,cleaned twice during the 1 week stay,tissues,kitchen paper etc etc.the list went on! the shower is really powerful and fantastic hot water all the time. Reggina is a diamond with her restaurant and places to see advice. on site management 24 hours. we didn't notice their wasn't an oven until we arrived but that's our fault,but there is a hob and microwave. fantastic location to see the island from. jasmine on the balcony was stunning! Brilliant apartment, very spacious and clean. Lovely balcony with a hint of a sea view. Very thoughtful basket of cookies, honey and wine on arrival. Great communal pool. 5 minute drive into Sami. Rocky beach opposite the apartments but sand/pebble beaches a short drive away. A great base for exploring Kefalonia. Kefalonia is the largest of the Ionian Islands off Greece' west coast, which also include Corfu, Lefkada and Zante (Zakynthos). The Island boasts excellent tourist resorts, the biggest being at Lassi, Poros, Skala and Sami. Smaller more laid back resorts are at Lourdata, Katelios, Assos, Argostoli, Lixouri and Fiscardo to name a few. The island is not only the largest amongst the Ionian Islands, but also features the highest mountain, Mount Ainos, which reaches a height of 1627 M, and covered with Kefalonian fir trees. On a clear day the summit provides stunning views of the neighbouring island of Zante (Zakynthos), Lefkada and Ithaca. Karavomylos is one of the regions of the island most blessed by the unspoilt beauty the area is famous for, with wonders both natural and man made close at hand..One of the many surprising gifts of nature to be found in Kefalonia, Lake Melissani is a stunning underground lake. Close to Karavomylos, only a half kilometre from the sea, this cave-lake has an open roof allowing the light to play on the surface of the water and cast vivid colours and reflections on the glistening walls of the cavern. Small boats circle the lake offering breath-taking photo opportunities of this natural phenomenon. Its Greek name 'cave of the nymphs' reinforces the widely held opinion of those who study the Greek Odyssey, that Lake Melissani is in fact Homer's Cave of the Nymphs, a place of mischievous magical creatures! Tourists can expect to find a variety of activities across the island, from horse riding to hiking, snorkelling and scuba diving, watersports and boat rentals to name a few, or simply explore the islands many olive groves, vineyards, caves, churches and monasteries, and of course the many stunning beaches, including the world famous Myrtos beach, Antisamos beach, a popular beach only 20 minutes away, with taverns and beach bars. Whether you want a mountain trek, a dungeon crawl through an ancient castle, a tour through millions of years old caves with underwater lakes, kayaking around the island or just to relax next to the clean refreshing Ionian sea, Kefalonia can accommodate you in a way few other destinations can match.